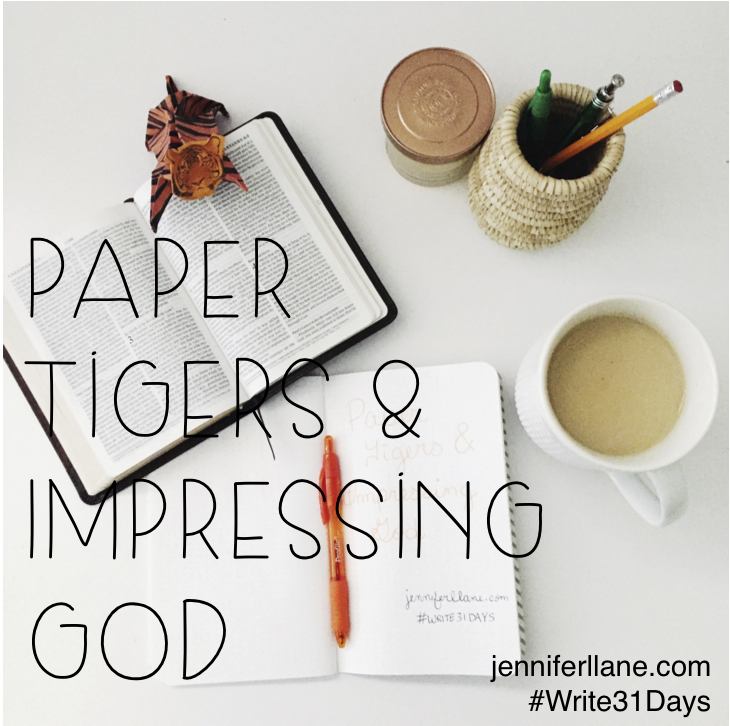 Today has mainly been focused on life after #write31days. Completing this big writing challenge was really cutting into our wearing clean clothes and having groceries in our cabinets. Today I did laundry, ordered groceries, and did a full day of home school work with my 1st grader. I wrote about 20,000 words this month. That's an accomplishment. Even better is the fact that I feel much more confident in my understanding of this topic. This topic isn't just some facts or trivia. This topic is at the heart of my identity in Christ. I feel more sure about my relationship with God after thinking through and writing this series. I pray this series has helped your relationship with God as well. This verse is a comfort as we abide in Him and live out the calling He has placed on each of our lives. Whatever comes our way, every single thing, can be used for good. We were chosen by Him, and we are called by Him. We are made right with God, just as if we had never sinned through His blood, and some day we will be glorified in Heaven with Him. God's Word also tells us that everything that is good is from God. The absolute only way to have goodness in our life is to receive that goodness from Him. Abiding in Him guarantees that our lives will be filled with His goodness. Anytime bad things creep into our lives, God has the ability to make those bad things work for good, whenever we are called according to His purpose. As we stay living His calling and abiding in Him, we allow Him to bring His goodness into our lives. This all sounds so simple, doesn't it? My work-hard, try-hard, striving nature causes me to worry that I'm not doing the right things to abide in Him. What if I skip my Bible reading time too often? What if I am mistaken about my calling? What if I'm bad at remembering to pray? All of these questions come from a place of fear, fear of not being "good enough" to be in a relationship with God and fear of not being "good enough" to be used by God. We have to realize we have been justified by Christ. Our faith in Him is what makes relationship and calling possible. We don't have to be "good enough." Jesus was perfect. He is all we need. We are justified. Our flesh want to lean into following rules and check boxes that will tell us that we are "good." God just wants our faith. We show that faith when we lean into Him to be our justification. It was Abraham's faith that made him righteous. It will be your faith that will make you righteous. Because God offers this righteousness to us through His Son Jesus, we know God is so good. Not only that, but everything God created is good. For everything created by God is good, and nothing is to be rejected if it is received with thanksgiving, for it is made holy by the word of God and prayer. God invites us into good teaching and sharing the Good News with our friends and family by receiving goodness with thanksgiving. This is our calling. We have all been called in the Great Commission to make disciples. We make disciples when we share the goodness of God's Word with the people in our life. We will not be perfect disciple-makers; we are not Jesus. But as we lean into abiding in Him, having faith in Him, sharing the truth of the gospel, and knowing we don't have to be "good enough," He will be faithful to bring goodness. I am the Real Vine and my Father is the Farmer. He cuts off every branch of me that doesn’t bear grapes. And every branch that is grape-bearing he prunes back so it will bear even more. You are already pruned back by the message I have spoken. Abiding in Him. It is the key to everything we have been talking about. If we live our live making our home snuggled down into Christ as our identity, as the Holy Spirit dwells inside us, just like the Holy Spirit dwelled inside that ark, inside the Holy of Holies, inside the tabernacle, then we will naturally avoid these paper tiger pitfalls we've been discussing. It sounds impossible, but our goal is to live a life where you really can't tell where you end and Christ begins. We live as heirs to the great inheritance. We live as sons and daughters adopted into His family. We live as servants, laying down our life for His will. We gain life as we respect and submit to His will, following His example of servanthood. Abiding in Him makes good works possible, and when we realize that we can do nothing on our own, we know our works can never impress God. The work was always His. Abiding in Him is how we bear fruit. We don't just behave ourselves, we actually have unnatural, unconditional love for our fellow humans. We have joy on our worst days. We have peace when the world is spinning out of control. We have patience when we cannot muster it on our own. We are outlandishly kind when the flesh wants to lash out. Goodness, faithfulness, and gentleness become how we relate to our fellow Believers and the world. We have self-control when our flesh is weak. We are not on our own trying to avoid the fear of failing others and trying to avoid people-pleasing. When we remember love is the goal, we know we should treat others with grace and truth, just as Jesus came and lived His life. Grace and truth are only possible through abiding in Him. We are not on our own hoping that our good works, our service in His Kingdom, will succeed and please God. If we join in His work, as a friend and co-worker, we don't have to worry about pleasing Him. He is pleased with His work. His work succeeds, maybe not by worldly standards, but by Heavenly standards. A minister friend, Angel Martinez, like to change that quote to say, "There is no limit to what God could accomplish if no one cared about getting the credit." We live in a time in history in which fame is easily accessible, and it is easy to blur the lines between ministry callings and celebrity. It is called influence instead of fame because that sounds more spiritual. No judgement from me. I buy the books, follow on Twitter, take notes in the conferences, and listen to the interviews. I do all the things. As someone who has a dream to publish a Christian book, I wrestled with a lot of feelings surrounding this issue. I've asked myself if I just want fame. Do I want credit? It is easy to see where this might be a question when it comes to producing media like a book. The truth is that this is a question at every level of ministry. Find the smallest town church, and I guarantee that the church staff and volunteers have concerns about getting credit for their gifts to the church, their good works in their community. It is human nature to crave recognition. It is a common occurrence to be recognized for a secular accomplishment and take credit for the remarkable achievement. In many cases, the man or woman being honored knows the Lord, and he or she decides to give glory to the Lord for giving them life, talent, ability, and good timing to be recognized. They realize it would be foolish to take credit when God has made everything about the moment possible. In ministry, the disciple, whether he or she receives a paycheck from a church or not, should also know that it would be foolish to take credit for any good work. We should know that we, as humans, have absolutely no power to make someone receive Jesus. The Holy Spirit must draw someone to Christ. Christ must stand at their heart's door and knock. This is a work of God, and we cannot manufacture it. Works of God do not end at just salvation. God is completely sovereign. He makes all the decisions. God is already at work in the world around us, in my community and in yours. We can choose to join what He is doing. God will sometimes ask us to join Him in what He is doing. When we join Him, we work with God, but He is doing the work. We will never know until Heaven how many believers have had a part in fulfilling God's plan. Any victory for the Kingdom usually includes multiple seeds planted, multiple prayers, and a move of the Holy Spirit. He deserves the credit. Here's a song. Seriously, the 2000s were the best music. As I began writing this series, realizing how much I had wanted to impress God, the phrase "audience of one" began to sound wrong. I really had to think about if I thought this was bad advice or not. I went to the Bible to find some clarity. Should we be doing everything for an audience of one, meaning God? The verses I found on this subject seemed to be in two different categories, the work we do in a workplace and the work we do to serve others. In the case of workplace work, the verse I found is actually addressing slaves. Context matters. This verse comes from a letter Paul wrote to the church in Colossus, and he had just asked wives to honor their husbands, husbands to love their wives, and children to obey their parents. Even as a slave, we should not be people-pleasers. We are to work, whatever the work may be, as if we are working just for God, even in the harshest of work conditions. If we are taking orders at a fast-food restaurant, cleaning bathrooms, entering data into computers, stocking shelves, preparing reports, making sales, washing other peoples' clothes, or writing code, we should do the task in a way that pleases God. The Message version of this verse is worth reading. Another kind of work we do as Christians is good works. When we serve others, we are commanded to do it for only the Lord as well. These words are straight from the lips of Christ, and he warns us to avoid looking like a hypocrite by serving others in secret. I've been serving others all of my adult life in ministry. Serving in secret is easy some days, no one is watching because, honestly, no one cares. Other days, it is not as simple. My husband's job is to tell others about the work we are doing downtown in ministry. He produces a tv show that has a large segment informing others of the ministry we are doing. Our church couldn't serve the hundreds of families and children with just the tithes we receive on Sundays. We have to raise money to fulfill the mission we have downtown. We have never thrown fundraisers, but we have taken the approach of telling people what we are doing and then depending on God. As we tell people what we are doing, God prompts them to give to our ministry. We have been serving families and children in the neighborhood surrounding downtown for 20 years now. This month marks 20 years of ministry, and the Amarillo Globe News came downtown to do a newspaper story on our church. Is all of this non-secret ministry going against the words of Jesus? I don't think it is. God has used our tv shows, newsletters, and other media to provide for our ministry. In some circles, there are public relation people employed to organize service by celebrities only for the recognition and nothing else. That actually happens. I ask myself, "Would I stop doing this ministry if I was never recognized for it?" And, "Does me telling others about my service actually go to encourage more service?" And, "How do I feel about the service I've done where I am never recognized? Am I still glad I did it? Am I doing all of my good works with The Lord as my audience?" The Message version of this verse says it this way. I think the reason "audience of one" sounded off is that audiences usually applaud. I've been in a lot of audiences at concerts and shows. The audience is impressed with the performance that took place, and they whistle, yell, jump, and clap to show their appreciation. God is not that kind of audience. We should only be concerned with what God thinks of us, but we shouldn't be expecting applause. He loves us. He is pleased with us; He promises rewards in Heaven, but we cannot strive to impress God. Yesterday we talked about how seeking social justice was an important part of living in God’s will, therefore we couldn’t just “rest in Him” and ignore injustices. It is important to point out that rest is a necessary, important part of living for Christ. We should take time every week to rest. These verses in Hebrews warn us of the danger of not taking time to rest. It warns us that rest is necessary because failing to do so will lead to hard hearts toward God. The word harden is used three times and the word rebellion is used twice in these 8 verses. There is a direct link between taking time to rest and becoming rebellious and hard hearted towards God. The thing about rest is this, you have to actually be at work during the week to be resting from work. There is no such thing as rest from rest; there is only rest from work. We join Him in the work we are called to accomplish of advancing the gospel and bringing His justice into this world, and we take rest breaks. God modeled rest when creating the world in six days and then taking the seventh day to rest. God didn’t need a day off; He’s God. He took day seven off for our benefit. He was being a good Father and modeling healthy behavior. In this series we are learning how to do His work without thinking that how we perform at His work changes our status as His child or thinking we will impress God with what we do for Him. Resting is an important part of doing His work well. If we are obeying Him and joining in His work going on here on earth, we will and should be able to include rest in our lives. Here's a song for all the "dry and weary souls." Yesterday I talked about a moment I remember coming to the end of myself when God let me get all tired out. That moment, that night before the women’s event I had helped organize, brought up so many questions, both in the moment and as I am remembering it. Was that feeling a spiritual attack? Was it the devil trying to discourage me? I don’t always know when I am in the middle of a spiritual attack, but it is usually very clear afterward. Afterward I can see the lies the enemy has thrown at me, and I can see the lies I mistakenly believed. Spiritual attacks are real, but I don’t think that night was a spiritual attack. There was harmony and peace in my home. My husband was right beside me, encouraging me and offering to help. Why are some things “successful” and other things are “not”? We ended up having a little more than a hundred women register and attend our event. That might sound awesome on its own, but the year before, we had attendance of 500. Was this event less successful? Had God blessed our efforts the year before and chosen not to bless our efforts the next year? We serve a Shepherd that leaves the 99 to seek after the one. He died one death, and He would have done that work for just one soul. We will never know why God may ask us to do something that might have low numbers or look insignificant. I emailed a group of women who had participated to ask about their experience. I was blown away by their stories. God definitely moved that weekend, despite my feeling insignificant or unsuccessful. Not all of my questions in the ministry always feel answered. It is a struggle as I serve. Not all of your questions will feel answered either. He asks us to come along and serve, join Him in what He is doing here on Earth. To do that, we must have faith. When we have faith, we aren’t promised easy answers, rested nights, and worldly success. We are promised that He will never leave us and never forsake us. That’s just going to need to be enough. I could not have begun to learn how to quit fearing paper tigers without coming to the end of myself by tiring myself out. I was like that annoying toy in the bottom of the toy box that makes noise every time something gets jostled. I needed to run out of batteries. This didn’t happen overnight, but over a series of events over three years. Let me list them for you. 1st -- My first mission trip overseas. I came home with such a passion to change the circumstances that I saw children living in. I rallied friends and strangers to donate every cloth diaper I could get my hands on. 2nd -- My second mission trip overseas. I was so excited to take supplies to the orphanages we had visited. I began to realize that my efforts were such a drop in the bucket of meeting the children’s needs. I began to realize that my efforts were good, but they weren’t world changing because the problems were so vast. 3rd -- I said yes to almost anything that advanced the gospel, no matter how difficult it might be to accomplish. I was afraid I would miss something God had for me. I was afraid that if I didn’t say yes, that no one else would say yes. 4th -- I picked “ardent” as my word for the year because I was so gung ho excited to work hard changing the world. 5th -- I was standing in the living room crying because I was so tired. I felt like I was doing all the right things, and God was holding out on me. I was serving Him, and the burden was so far from light. It was the night before a women’s event, and I had worked so hard all week. I had missed some sleep, and I knew I wouldn’t get sleep until the event was over. There was a detail that had to be handled before I could go to bed, and I knew it wasn’t going to be easy. Why wasn’t God looking out for me? Why hadn’t He sent more help? Why was the response less than I had expected? Why are some things “successful” and other things just not? Was this a spiritual attack and I was just too immature to see it? 7th -- I had a tough summer because of low vitamin d. I was running on empty, and I had been for months and months. I had to do some self care over the summer that resulted in a really great tan. God showed me a passage in Galatians, and as I read it in The Message version, my eyes were opened to how deeply I was people pleasing and God impressing. God began to shift my thinking and open my eyes to His truth. 8th -- My third mission trip overseas. The lesson that what I can do on my own is so insignificant really finally was sinking in. I could see that what we had done was only effective because Christ moved in spite of our efforts. I began trying to verbalize what God was teaching me, but it was coming out all wrong. The ideas I’m sharing in this blog series began to sprout on that trip. That moment crying in my living room was just a piece of the story God was sewing in my life, teaching me this lesson, but I can so easily recall that feeling. I felt completely alone in my pursuit to live out a calling for Him. I felt like even God was not doing His part. I wanted God to be proud of me, impressed by all that I was doing, and He was holding out on me. This feeling, these questions are the heart of why I’m writing this series. We’ve covered some ground on our topic; we are almost to the half way point of our 31 days. Over the next few weeks that we have left, I hope to answer at least a few of these questions that we maybe have not answered yet. Tiring out and coming to the end of myself was just the beginning. What actually took place is this: I tried keeping rules and working my head off to please God, and it didn’t work. So I quit being a ‘law man’ so that I could be God’s man. Christ’s life showed me how, and enabled me to do it. I identified myself completely with him. Indeed, I have been crucified with Christ. My ego is no longer central. It is no longer important that I appear righteous before you or have your good opinion, and I am no longer driven to impress God. Christ lives in me. The life you see me living is not “mine,” but it is lived by faith in the Son of God, who loved me and gave himself for me. I am not going to go back on that. I've already shared this song once (or maybe even twice), but it it is the theme song of my journey here. I love it so much. This vid has lyrics, so there's that. Since we are talking about grace, I’m going to let you practice grace. I’m going to tell you my new favorite tv show, and I know it will exercise your grace muscles because: 1. It was brought up in my son’s Sunday school class as a bad idea this week. And 2. I don’t even think my tv friends think it is good. I’m sorry I can’t quit watching it. I’ve even watched some of the episodes multiple times, something I rarely do. It is the new NBC show The Good Place. Stop it. I heard you groan. That’s not nice. If you haven’t heard of this tv gem, let me tell you about it. The premise is this, a women dies and finds herself in an office where she is told that she has been good enough in her life on Earth to end up in “the good place” instead of “the bad place.” In the show, there is a point system that adds or subtracts points (or fractions of points) for every single action you have done in your life. The problem is that there has been a mistake and this woman who finds herself in “the good place” is actually an awful person who doesn’t deserve to be there. Almost everyone who has ever lived ended up in the bad place, for example, the only president who made it to “the good place” was Lincoln. The people who have made it to “the good place” are annoyingly good, and this woman obviously doesn’t fit in. Comedy ensues. You get the picture. I also love tv fake cursing. Now we have something to add to our Battlestar Galactica's fracking. If you can't laugh at fake tv cursing, what can you laugh at? Usually I hate shows or movies that have bad theology laced into their plots. I cannot tell you how mad I was leaving the theater after the Arnold Schwarzenegger movie End of Days. I just looked at the Rotten Tomato score, and it is 11%. I think 11% is too high. For some reason this show has hit me differently. I think I know why. The point system from the tv show isn’t much different from what most humans feel like would be a fair system of eternal judgement. We’ve all heard the scale system of measuring our good and bad actions described one way or another. It sounds fair right? If our good outweighs our bad, Heaven! And vise versa. The thing about this weight system and the point system on the show is that it actually isn’t fair. What about people who live longer and have more of a chance to rack up more points? What about people who have bad parents, who aren’t taught good from bad? What about people who have only bad influences in their lives? What about criminals who decide to change their life and begin to do good? The show, whether it intends to or not, is showing how unfair the “fair” point system actually is. What about real, honest-to-goodness, truth-from-the-good-book theology? It shows itself superior to this man-made point system. Jesus came and died for you and me, not because we deserved it, but because He loved us. Through His death on the cross and our accepting of that free gift, we are extended that beautiful gift of grace. God offers us something better than the frozen yogurt laden land that is the tv version of after life perfection. God offers us a place in His house, His perfect eternity, Heaven. Grace means we do not deserve this. Mercy means He withholds the punishment we do deserve. We have been offered grace because He loves us. We love God back, because how could we not? He loved us first. And how we show love for others is offering them grace as much as humanly possible. I like to share a song with each blog post. This one is a little serious for such a silly post, but whatevs.